Ubuntu Software Center 2.1.5 was released today in Ubuntu 10.10 Maverick Meerkat. This new version doesn't bring many visual changes but there's a lot going on under the hood. A major new feature in USC 2.1.5 is the implementation of plugin support (important for the oneconf integration). However, there are no plugins available for now. 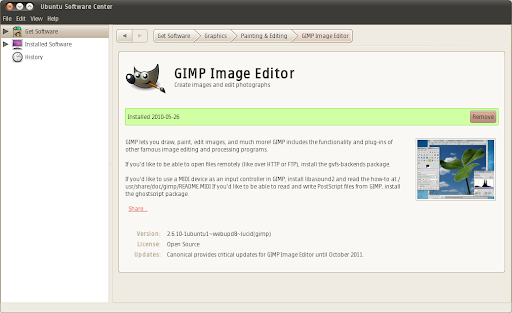 A complete changelog for Ubuntu Software Center 2.1.5 can be found here. 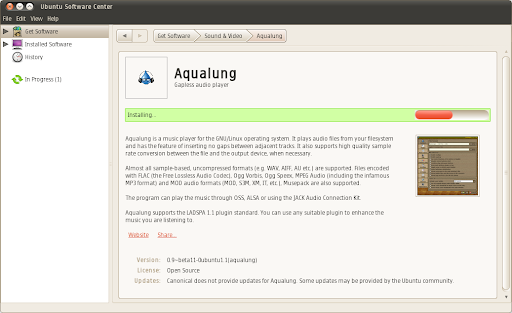 Want to try Ubuntu Software Center 2.1.5 in Ubuntu Lucid already? Until Guiodic uploads it to his PPA, you can download and install these dependencies: aptdaemon, python-aptdaemon-gtk and python-aptdaemon (all these debs work for both 32bit and 64bit) and then simply download the Ubuntu Software Center 2.15 from Ubuntu 10.10 Maverick Meerkat via Launchpad and install it.